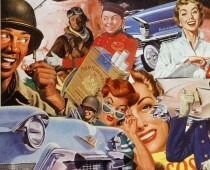 Some have been likening Jeb Bush’s recommendation for the public shaming of unwed mothers as a throwback to the 1950’s. One needn’t go back that far. How about 1992 when another member of the Bush entourage, Dan Quayle did the same thing. What seems like a loopy moment when politics and popular culture collided, the Vice President of the United States chided fictional TV character Murphy Brown for having a child out-of-wedlock. For those too young to remember, Dan Quayle was Poppy Bushes good-looking but dim-witted Vice President, the Sarah Palin of his day, famous for putting his foot in his very conservative mouth. As silly as this seems, this feud between the fictitious TV character and the Vice President caused quite a robust dialogue in the 1992 presidential election. 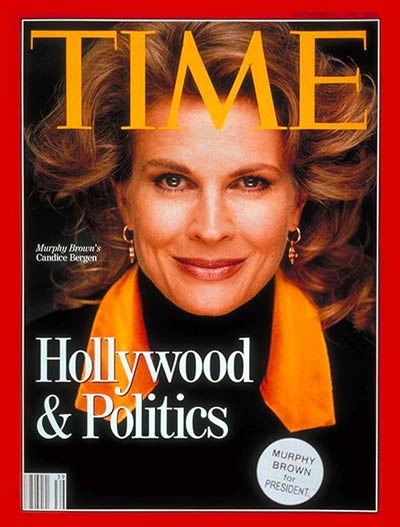 On May 18, 1992 Murphy Brown a fictitious 40-something, single, news anchor played by Candice Bergen on a popular sitcom of the same name, gave birth to a baby boy on her show to the delight of millions of viewers. 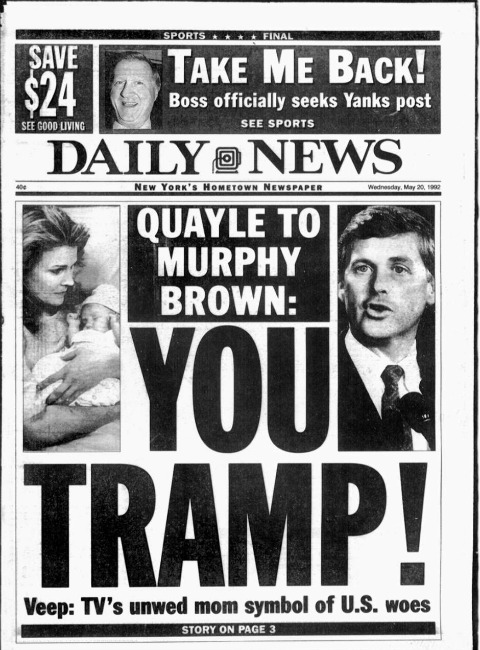 A day later, Dan Quayle while making a campaign speech, played the family values card arguing that Murphy Brown was sending the wrong message – that single parenthood should not be encouraged, citing the CBS show as an example of the decay of family values in America. The topic erupted into a major campaign issue as the country debated the morality of Murphy’s decision to be an unwed mother. Whenever President George H.W. Bush appeared before the media he was asked about Murphy Brown’s baby. The debate raged throughout the summer pitting liberal ideas of an evolving concept of family, against the more traditional Ozzie and Harriet model. By 1992, the 2 parent nuclear family that Quayle suggested as an antidote to urban violence and moral decay was already on its way out. Despite it being over 20 years since the Murphy Brown – Dan Quayle kerfuffle why are we are still talking about shaming of unwed mothers and what constitutes a real family? Despite it being over 60 years since Christine Jorgensen returned from Copenhagen, Denmark, why are we still talking about Caitlyn Jenner and where to place her on the human spectrum? Too bad there is no public shaming for politicians. Alas, it continues to amaze me what politicians will say for attention. And we think the Khardassians are bad.